Potlucks are a great way to enjoy a variety of foods and socialize with friends. I haven’t been to this type of party in a while, but went to one recently. Thankfully, I had this recipe for Chicken Spaghetti which works perfectly for this occasion. To my surprise, this dish was a big hit and guests gobbled up the meal quickly. This is actually a simple dish to make and I was happy it was so well received. This delightful peppery, cheesy dish melts in your mouth and is a great meal for a potluck party. Enjoy. Mix... chicken, spaghetti, celery, onion, yellow and red peppers in a bowl. Whisk... together soup, broth and seasoning in a separate bowl. Add chicken mixture to soup mixture. Spread the mixture into a lightly greased 13'x 9' baking pan, sprinkle cheese over top. Cover with aluminum foil coated with non-stick vegetable spray. Bake...at 350 degrees for 45 minutes. uncover and bake for 10 more minutes. WHEN WAS THE LAST TIME YOU WERE AT A POTLUCK? I love potlucks, you get so many ideas from other cooks. I will try this recipe without the chicken as my teens are vegetarian. Crazy kids! 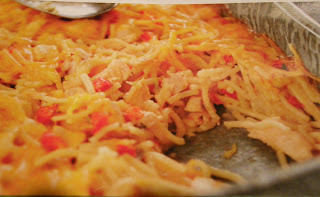 Seems easy enough, and some of our favorite foods..
Chicken Spaghetti?! Spaghetti is a huge favorite in my house! I don't know why I have never thought of doing chicken spaghetti! Thanks for sharing the recipe! Yum.. THhanks for the great recipe! Looks simple and easy! Great for busy working moms! That looks amazing. I will have to try it. And so easy to make which alwasy wins me over. That looks very easy to make. And, chicken mixes it up from the usual marinara or meat sauce. Good choice for a pot luck. Sure looks very tasty, I might as well try this recipe. Thanks for sharing. I do not eat meat but may have to try it for my husband. Pot lucks were a way of life when I lived in colder climes. This dish looks just super. will try this recipe for sure! That looks absolutely delicious. I have a pot luck coming up, and I think this will be just the ticket for it! Sieht ja sehr lecker aus. Da bekommt man doch gleich wieder Hunger.